Shōbō-ji temple is located in the peaceful area in the north-west of Kyoto close to Ōharano Shrine and belongs to the Tō-ji branch of the Shingon school of Buddhism. Shōbō-ji is home to numerous treasures and rare Buddhist statuary, including an image of a thousand-armed Kannon with three faces, but it is most famous for its beautiful borrowed scenery garden that showcases rocks brought here from all around Japan. The shapes of the stones resemble various birds and animals, and in the distance beyond the garden wall you can see Kyoto cityscape and Higashiyama mountains. With the sakura trees blooming in spring, the lush greenery of the bamboo grove and the moss in summer, brightly colored maple leaves in autumn, and fluffy snow in winter, the garden is ever-changing, making Shōbō-ji a picturesque destination thankfully distant from the usual tourist routes. 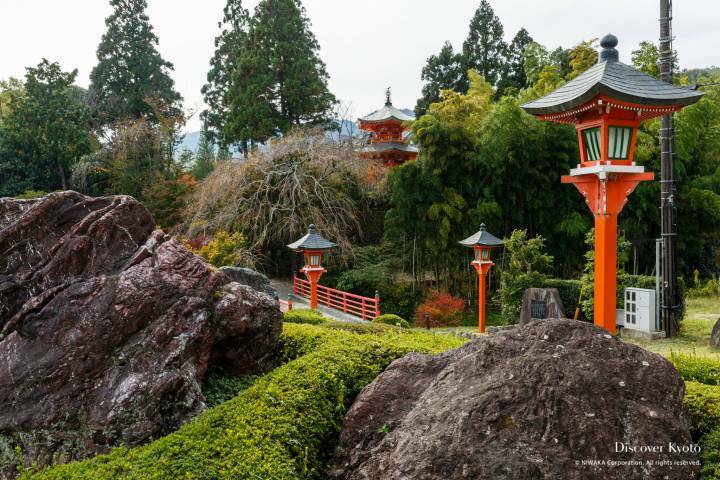 Shōbō-ji is most famous for its beautiful borrowed scenery garden, where the shapes of the stones resemble various birds and animals, and in the distance beyond the garden wall you can see Kyoto cityscape and Higashiyama mountains. The imposing building atop a flight of stone stairs, flanked with two Niō guardians under a sakura and a maple tree, is the Fudō-dō hall of Shōbō-ji. 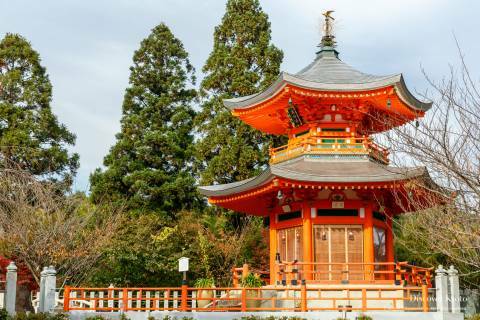 It houses a striking reddish statue of Kasuga Fudō Myō’ō, “the immovable guardian”, revered as a protector from evil, and people pray here for safety and prosperity, recovery from illness, and protection from disasters. 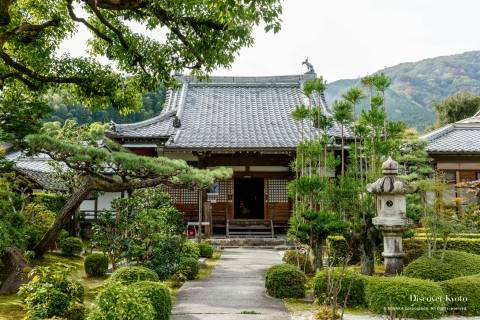 This is also a good vantage point to take in the surrounding landscape, including the temple’s pagoda and some newer statuary, as well as a round flowerbed curiously designed with a Sanskrit symbol. Behind the building you will find the Kasuga Inari shrine and a small waterfall with an arching red bridge next to it. On the other side of the Fudō-dō towards the Jizō statues another experience awaits: here you can listen to the suikinkutsu, or the water harp! Use the ladle to pour some water onto the stones below, put your ear to the end of the pipe, and check for yourself if the music produced by the drops reminds you of the sounds of a string instrument. 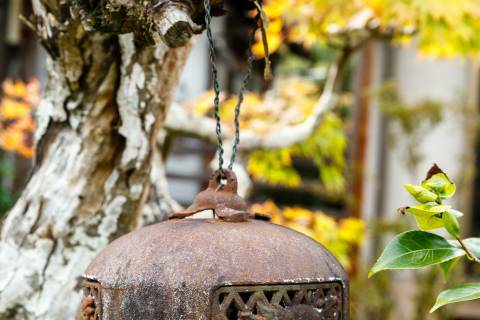 A bright vermilion pagoda crowned with a golden finial shaped like a bird of prey is a shining beacon visible from the approach to Shōbō-ji. Originally built at a site next to Kōdai-ji and Ryōzen Kannon temples in 1908 as a memorial to soldiers who perished in the First Sino-Japanese and Russo-Japanese wars, it was moved to its present spot around 2009. This two-story hexagonal pagoda is a relatively recent structure, but its architecture is based on ancient and medieval historical buildings and combines traditional and modern techniques. Take a closer look to admire the intricate metal decorations, the lacquerwork, the nameplate calligraphy, and the detailing of the roof. The main hall at Shōbō-ji was reconstructed recently, but its foundation dates back to the Edo period. It faces a beautiful landscape garden spreading out towards the main gate and houses centuries-old Buddhist statuary, which can be considered one of the key attractions of the temple. The largest statue in the center is Sanmen Senju Kannon, a rare image of a thousand-armed Kannon with three faces. It was made in the early Kamakura period (about 800 years ago) and is 182 cm in height. Carved out of wood and plated with gold foil, it reflects the transition between Heian and Kamakura styles and is very well preserved. What makes this statue unusual is two other large faces (called kebutsu) on both sides of its main face. It is said that this way Kannon can face not only of the present, but also the past and the future. To the right side of this three-faced Kannon is a statue of the bodhisattva in original form called Shō Kannon, the oldest one in Shōbō-ji and its principal image since the temple’s founding. This statue was supposedly carved by Shingon school founder Kūkai (Kōbō Daishi) himself when he was 42 years old (around 816) to provide protection from evil and misfortune. Another statue to the right of Senju Kannon is Dainichi Nyorai (Vairocana Buddha), dating back to the Muromachi era (1336–1573). To the left of Senju Kannon are two statues of Amida Nyorai (Amitabha Buddha), also carved in the Muromachi era. Closer to the hall entrance you will find a statue of Yakushi Nyorai, the Buddha that was worshiped by the founding priest Chii Daitoku back when Shōbō-ji was still a hermitage. Press the button next to the prayer area to listen to explanations in Japanese, or read the leaflet with a detailed overview in English specially provided by the temple. Hōshō-den hall, connected to the main hall by a short passage, is the perfect spot to sit on tatami mats and enjoy the view of Shōbō-ji’s famous stone garden. However, make sure not to miss the treasures in the hall itself: a fierce-looking statue of a six-armed Aizen Myō’ō, one of the Buddhist wisdom kings who grants strong relationships and marital harmony, and an unusual statue of a running Daikokuten, one of the seven gods of fortune, in a hurry to bring happiness to people. 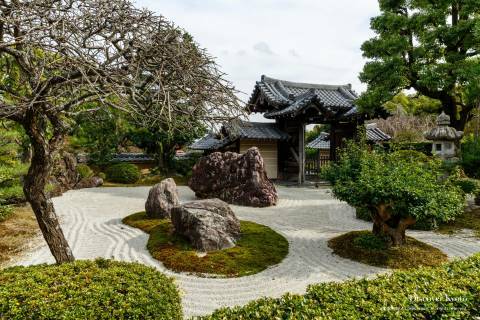 The famous Hōshō-en garden in front of the hall with multiple stones placed among the carefully raked white sand is definitely one of Shōbō-ji’s highlights. The shapes of the stones resemble various animals and birds, giving this beautiful garden its alternative name of “the rock garden of birds and beasts”. There are a total of 16 stones representing 15 different species, and it is a fun pastime trying to spot them all! The lion and the frog are easy to identify, but look also for the parrot, the rabbit, or the penguin… There is a helpful picture guide to check if you managed to get all the animals correctly! After the capital was moved to Kyoto, Emperor Kanmu (737–806), Fujiwara no Michinaga and other court nobles of the Heian era often came to the Ōharano area to hunt. Its idyllic scenery was loved by many and often mentioned in poetry throughout the centuries, and in this tradition the current head priest of Shōbō-ji commissioned his childhood friend and artist Nishii Sayoko (1947–2000) to paint 41 sliding screens with landscapes of Ōharano for the temple’s drawing room and other quarters. Born and raised in Ōharano, the artist worked relentlessly on the paintings while fighting a terminal illness, managing to finish 17 pieces before her death in 2000, and the rest of her rough sketches were completed by other members of her art circle. The sliding screens of Shōbō-ji became her final work and an ode to her beloved land, depicting the breathtaking beauty of Ōharano, the local flowers and plants, and the surrounding Nishiyama mountains. Take some time to admire the mountain ranges gently covered with fresh spring greenery and the seasonal flowers and herbs painstakingly and realistically painted onto the large paper screens. Shōbō-ji was established by a monk called Chii Daitoku who came from China in 754 to propagate Buddhism in Japan with his master Jianzhen (Ganjin in Japanese), who later founded the famous Tōshōdai-ji temple in Nara. Chii Daitoku built a hermitage in Ōharano and pursued ascetic Zen practices there. The original structure was called Kasuga Zen-bō, and around the year 800 it was developed into a temple by the renowned Japanese monk Saichō (posthumously known as Dengyō Daishi) in homage to Chii Daitoku. At that time, it was one of the subtemples of a large temple named Ōhara-ji after the area where it was located. Like most others in Kyoto, this temple burned down in the fires of the Ōnin War (1467–1477), but was later restored by priests Eun and Choen in 1615 under the new name Shōbō-ji. Keisho-in, mother of Tokugawa Tsunayoshi, the fifth Tokugawa shogun, frequently visited this temple, and as a result, it was also patronized by the shogunate and became the Tokugawa family temple at that time (1680–1703). Due to her influence, Shōbō-ji along with many other temples underwent reconstruction during the Edo period.